The makers of Pirate Galaxy and Dino Storm are back with a new browser-based strategy MMO game, this time set in an alternative past where steel, steam and oil are the mandatory resources for the military units. 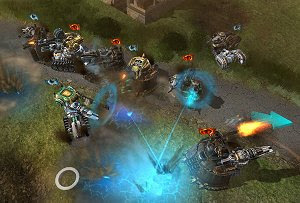 In Steel Legions battles are fought between the four empires with giant steel machines driven by half a dozen of men and women. Choose your faction and enter this war for the precious resources, experiencing exciting battles against other players and upgrading your massive steel units.